When it comes to chocolate, I don't discriminate. I love chocolate in every form and every variety - milk, dark, and white. I have been known to even eat that 20p value chocolate you get in the supermarkets. So, inevitably, Easter is a very good time of year for me. Maybe not for my bank balance or waist band but definitely for my stomach. I am a big fan of Easter eggs but having a few of my family members being diagnosed with a range of allergies this year, it has opened my eyes up to the fact that not everyone can gorge on chocolate to the extent that I do (I go true Bruce Bogtrotter style). That's why I wanted to share with you a product that is delicious but can also be eaten by my dairy and gluten free friends. And that is cake. Yes, hear me out. Bakerdays are a company that make cakes and send them straight to your door - what more could a girl want, right? You just have to have a look through their extensive range of cakes on their website (they really have one for every occasion). Then you select the type of sponge you'd like - be in chocolate, lemon drizzle, dairy free, or gluten free. You can even personalise it. 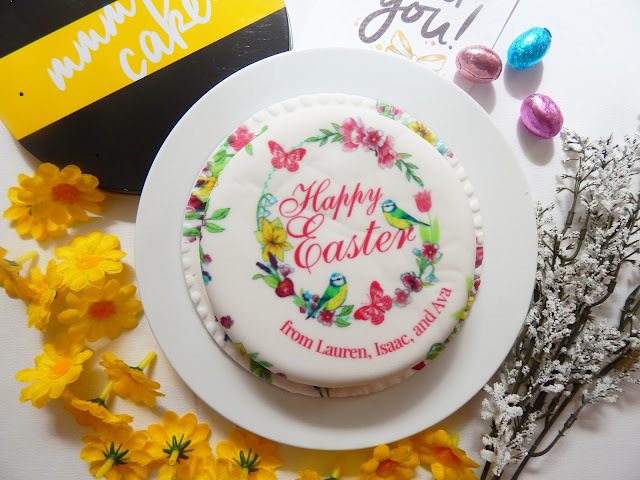 For my cake, I chose a lovely Easter design chocolate cake and personalised it to say 'Happy Easter from Lauren, Isaac, and Ava' (mostly for the gram, to be fair). My cake arrived very promptly in a lovely little tin with a couple of mini chocolate eggs and it was eaten by the end of the day - mostly by me, oops! The chocolate sponge was delicious and the chocolate icing that attached the ready roll style icing to the cake. I am not a huge fan of icing so that is my only complaint but the cake itself was amazing. They also do cupcakes so don't be surprised if you see a massive cupcake haul coming up soon. If you're thinking of buying yourself a massive cake to eat by yourself - I mean, you could share but what's the fun in that? - then use this code to get a 15% discount: EMERALDDOVE15. Have you ever tried a Bakerdays cake?